Description: All sites have a water view of Penobscot Bay. The sites close to the water are little smaller than further back but still a good size. The views are second to none. Friendly owners very accomodating. No sewer hookup but if you stay for a week you get 2 pumpouts free. Restrooms and showers are meticulious as well as the grounds. Check out the giant flowers the owners grows placed around the grounds. Bar Harbor is 45 minutes away, Camden and Rockport 30 minutes away. We stayed here the last 3 years and will be back this fall. Just a one nighter but we enjoyed it. Easy access into sites. Pros: The view! We found this site on the internet in January. We booked site 21 overlooking the Bay based on a review and pictures we found on this site. We are in California but will be back. Nice little local 9 hole golf course. Nice owners. Cons: Nothing from our point of view. Doesn't have a pool, we didn't miss it. Lobster fishermen just off shore. Maine residents from inland seek this place out to avoid the heat and humidity in the summer. Booked early. 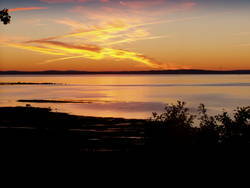 This campground is not located with a view of Penn Bay, as it is way east of the Bay. 2014 Redwood 36RE, disk brakes, 17.5" Sailun tires. Just overnight, but it was a very good experience. Dog friendly. Restaurant closed a few years ago, but not important as there all many, many close by in Belfast, which is really a delightful Maine coastal community. Proximity to Camden (Mt. Battie at Camden Hills State Park), Lincolnville (Ferry service to Isleboro, and Bucksport (Fort Knox observatory) We do a 3 day visit twice a year. Sewer lines on many sites now.